3 April 2014. Education for Global Development. United Nations Headquarters, ECOSOC Chamber. 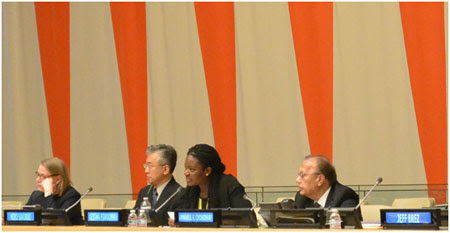 IHAN participated in the event, Education for Global Development, hosted by H.E. Anwarul Chowdhury and the Global Movement for the Culture of Peace. The question: What does it mean to be a global citizen, and what role does education play? Each speaker touched upon the need for further education, in both traditional and non-traditional ways. Speakers included Ambassador Chowdhury; Hiro Sakurai, UN Liaison Office; Ozioma Egwuonwu, New Future Foundation and Burn Bright International LLC; and Vibeke Jensen, Director of UNESCO New York. CSW 58 Commission on the Status of Women, United Nations Headquarters 10-21 March 2014. IHAN sponsored an event for CSW58, held on 17 March 2014, entitled “By Virtue of their Common Womanhood: Creating Daughters for Development in the Post-2015 Agenda.” Located at the Permanent Mission of El Salvador to the United Nations, the event had the following speakers: Marie Johns, OIC International; H.E. Carlos Enrique Garcia Gonzalez, Permanent Representative for El Salvador to the United Nations, Dr. Suzanne Stutman, Abington College, Penn State University, and a group of Medical Students from the University of Notre Dame, Australia. IHAN contributed a written statement to CSW58, which can be found on its website, http://www.unwomen.org/en/csw/csw58-2014/official-documents. 25 February 2014, Church Center, 777 UN Plaza. IHAN attends the NY Committee on Sustainable Development meeting. Presenting at the meeting was H.E. Ib Petersen, Permanent Representative for Denmark to the United Nations, on sustainable cities in Denmark. His presentation was inspiring, and brought to light the role that health, education, and sustainability play in urban development. IHAN part of Open Working Group 6 Steering Committee, December 2013. Dr. Dawn Digrius, representing IHAN, was invited to sit on the Steering Committee for the Open Working Group 6 for the development of the Post-2015 Sustainable Development Goals. Digrius, along with her fellow members of the Steering Committee, was responsible for choosing the speakers to present in front of the Open Working Group sessions in December 2013. By bringing together health, education, and development in the quest for sustainable goals for the world, we hope to create the Future We Want. Some key points addressed during the briefing included highlighting the priorities of the President of the General Assembly, H.E. John Ashe; that no one will be left behind, that going forward civil society will play an active role in the conversation, and that education and health are key aspects of sustainable development.